The housebuilding lobby insists that demand for new homes is outstripping supply, and that this has been the case for many years, decades even. But whilst it is fairly straightforward to measure housing supply, how is demand assessed? One place to look is Kate Barker’s review into the state of UK housebuilding. Her brief was to look at supply side issues but she does acknowledge that the relationship with demand is complex. She makes the crucial point that simply increasing the supply of new homes may in itself affect demand: Higher rates of housebuilding could also lead to higher household formation rates. (Barker Report 1.43). But she doesn’t really explore these issues in any depth. • work out what net migration levels will be. The answer habitually comes out at something like 215,000 extra households per annum. So this figure is taken as the basis of housing demand. And if we build less than this each year (we do), this is responsible for the shortage of housing and, it follows, the increase in house prices. But dig down into Holman’s and Whitehead’s report and you can begin to uncover a number of assumptions and guesses that call into question the accuracy of their work. • whilst it is easy to measure the marriage rate and the divorce rate, because each event is recorded, there are no accurate figures for co-habiting couples, nor for what happens to couples (both married and co-habiting) once they separate. How many couple up again? No one knows, they just guess. • longevity: we are as a population living longer and the models build in an assumption that life expectancy rates will continue to increase at the rates they have done over the past century. But will they? Again, no one has a clue. But even if their assumptions are correct, there is still a fundamental flaw in the way their demand figure is arrived at. It’s all just too mechanistic: the model makes no allowance for the fact that demand is itself affected by supply. 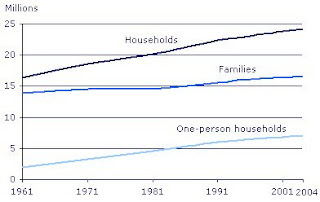 The size of the average household has been falling consistently ever since records began, but does this represent a profound social change or is it simply a reflection of the fact that there are far more houses around now and, given the choice, many people would prefer to live on their own or in small units. Back in Victorian times, it was not unusual to have families of seven, eight or nine living in two-up, two-downs. For them, this was normal; for us it would be seen as appalling overcrowding. What this demonstrates is that our standard of living has increased and we now expect to share bedrooms with no more than one other person. And without setting a notional accommodation standard for the country as a whole, how is it possible to determine whether our housing demand is real or just aspirational. If our aspirations are to live in smaller and smaller household units, then we cannot hope to meet demand until such time as everybody has a house of their own. Or maybe two. Why not? So demand as it is now defined will remain unquenchable. If we were to be building, say, 300,000 new homes a year, rather than 180,000 that we manage at present, we would simply be the moving the goalposts and would fine that the demand for new homes had inexplicably risen to 350,000 a year. And probably work out all manner of household formation statistics as if to prove it. The tail appears to be wagging the dog. So behind this lies a debate which has yet to be started. The subject is this: Is it the responsibility of government to provide a home for everybody who wants one? And does this include everyone who pitches up on our shores in future? Or do we now have to accept that that there must be limits to household growth, and learn to adapt to what we already have? I am always interested in where people come from and I was fascinated to hear world famous architect Daniel Libeskind, at a Shape East event in Cambridge this evening, discoursing on his youth in Poland, where he was born in 1946. He described being taken into the centre of Warsaw by his parents where there was only one tall building, which was the HQ of the Communist Party. It gave him a feeling of dread. The connection with tall buildings and power has stuck with him. He doesn’t mind tall buildings, it’s totalitarianism that upsets him. He said he has turned down project after project in China because he doesn’t like the regime. He’d much rather tussle with the problems of tough assignments, none more so than his designs for Ground Zero in New York. His original design for the Freedom Tower was to have been 1776 feet tall, to reflect the year of American Independence. He calls it embodied justice. Incidentally, by my reckoning he looks rather like Elton John, but he talks more like Woody Allen. That alone makes him quite a draw. He doesn’t appear to have got his first commission until the age of 43 but has signed off over 25 major projects since. In terms of global impact, he is now only rivalled by Frank Gehry. 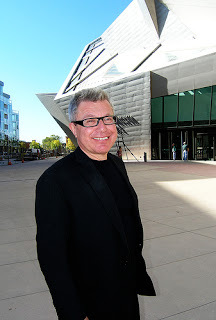 They have a lot in common but, whilst Gehry is known for his impossible curves, Libeskind is all about unfeasible angles and shards of light. They have both achieved fame and success through designing iconographic museums, which then went on to be commercially successful. Now he is inundated with requests from developers who want to build shopping malls that look like off-the-wall museums, hoping to add cultural significance to the shopping experience. Anyone for an air source heat pump? This man is Peter Ferguson and he'd like to sell you one. He owns and runs Trianco, the Sheffield-based, metal bashing oil-fired boiler maker. I spent a couple of hours with him on Monday, listening to his tale and sharing his dreams and aspirations. Oil boilers are a mature market. There are perhaps a million of them dotted around the country, mostly in out of the way locations where mains gas can’t reach. Each year, 60,000-odd new ones get installed, mostly as replacements. Trianco have a slug of this market, around 10%, but it’s not growing. Oil boilers, just like solid fuel boilers before them, would seem to be yesterday’s technology. Even with the recent move over to condensing boilers, there doesn’t seem to be much mileage left here for long term growth plans. The question is what will replace them. The world and their aunt are all harping on about renewables and carbon-free or carbon-lite power systems. With climate change slowly moving centre stage, it’s hard not to conclude that this is where the future lies. But there is still a lot of doubt as to which of the new technologies will succeed and which will fall by the wayside. • it’s cheap compared to GSHP and to all the other green power systems. To date, people have thought of heat pumps primarily as space heating devices. 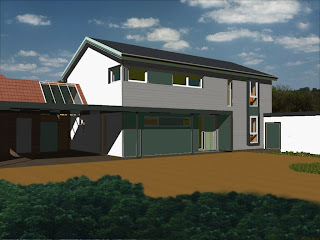 Ferguson’s Eureka moment came when he saw that it would be beneficial to position ASHP against solar thermal panels, as an alternative method of delivering hot water for the tap. Instead of spending maybe £3,000 or more installing solar panels on your roof, which, if you were lucky, would deliver just over half your hot water requirements throughout the year, here is a solution which would cost half this price and which would provide all your hot water. Because it’s a heat pump, it delivers around three times the energy it requires to run it, so potentially you could draw off say your 4,000kWh of hot water (typical of a modern household of four) for an outlay of just 1250kWh, cost around £100 a year. He is particularly interested in the small ASHP units, which are rated at 3kW output. The one in the photo I took is the larger 5kW one, so you can imagine that the 3kW one is almost half this size. Crucially, it is small enough to fit through the average loft hatch, and this in itself opens up a whole new market for heat pumps — small houses without gardens. The unit can get plumbed into the loft where the air temperature will, in any event, be a little higher than outdoors, and in about two hours a day it will be capable of delivering 150lits of hot water, enough for a couple of people. It’s not a renewable power source, as it uses electricity, but because the way heat pumps work, it will use about a third of the electricity an electric immersion heater would use, so it will deliver 6kWh of heat energy for just 2kWh of juice burned. Will it catch on? Well, it may do. 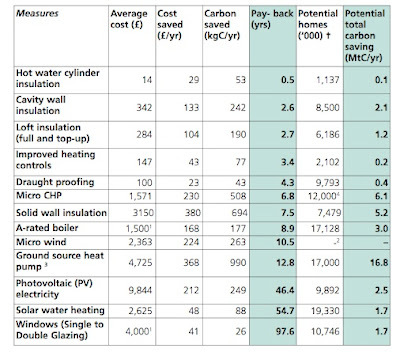 The one thing that makes Ferguson very bullish about his ActivAir heat pumps is that he can sell them for £695 + VAT. Compare that with solar panels (at around £2,500), or indeed any of the other renewable or carbon-lite technologies, and you can see that his ASHP units may well find a new market. The downsides are that the units are a little on the noisy side to be happily operating indoors. And the recovery rate, the time taken to replenish your hot water cylinder, is rather slow. The 3kW unit would take over two hours to recover, as compared with 30 minutes for a similar-sized cylinder heated by a conventional boiler. There is also the cost calculation to run through. Although ASHP will deliver three units the heat output for every one unit of electricity required to operate it, that electricity is always going to be more expensive than mains gas. And if the mains gas is a third of the price of mains electricity, then your cost saving vanishes. As it stands, mains gas is rather more expensive than this at the moment, but not by a lot, so the running cost saving is there, but only just. Unless of course you manage to run your ASHP unit on Economy 7, in which case it becomes very cheap to run indeed. But then you’d have it whirring away for a couple of hours every night whilst you slept. If you mounted it correctly, you wouldn’t hear a thing, but it would always be a concern that it could keep you awake. Trianco’s ASHP units are available in larger sizes. As well as the 3kW output, there are 5kW, 7kW and 12kW. This largest size is capable of taking on GSHP as a whole house space heating solution. Many people feel that it’s got to be less efficient than GSHP because outside air temperatures are habitually lower than winter ground temperatures, but Ferguson’s units work at good efficiencies down to —3°C, which is about as cold as it gets in southern England these days. And at £1895, it is way cheaper than any GSHP unit I have come across. At the moment, Ferguson is importing his ActivAir units from China, but has high hopes of bringing the metal bashing and assembly functions in house as sales demand rises. It’ll be fascinating to see whether he manages to establish ASHP as a serious contender for the future of home heating. It won’t be for a lack of trying. When we built our house in 1992, ventilation was one of the things I knew next to nothing about. We just went along with the suggestions of our designer and business partner at the time, Robin Gomm, combined with the wisdom of our electrician. We went conventional, which meant that our windows came installed with trickle vents and our wet rooms had the standard extract fans installed. Now I never liked those pesky trickle vents. It seemed to me that they either did nothing at all or they blew a gale through them. There didn’t seem to be much in between. Bit by bit, one at a time, I started closing them off — they are the type that has a hit and miss slider that enables you to close them. After a few years, they were all closed. It really didn’t seem to make any difference to the way the house felt or smelt. Then one day about seven or eight years ago, the fan in the en-suite bathroom cut out. It has been strategically mounted in the ceiling directly above the shower, and it was connected to the outside via a duct going up through the attic above and out via a vent tile in the roof. Up until then, I had religiously turned the fan on everytime I took a shower and my first thought when it broke was “Must get that fixed at once.” But, of course, a fan in your ensuite bathroom isn’t exactly a life and death issue so I left it for a few weeks. And I watched to see what difference it made. The answer was none at all. This is what set me thinking about ventilation, relative humidity levels and whether our present routines make sense. Here we had a fairly small, enclosed space, our ensuite bathroom, with no trickle vent open and no extract fan, and yet even in the depths of winter, there was no problem at all with excess humidity. Showers throw off a lot of water vapour and we typically find that the window and the mirror will mist up after a shower, but within a few minutes it’s all gone and everything appears to be normal once more. And having trickle vents open and fans on didn’t appear to make the demisting appreciably quicker. At this point, I went out and bought some hygrometers. They were only simple little greenhouse-style ones, costing two or three quid, but they served my purpose. It turned out that the relative humidity levels in the house tended to settle at around 50% to 60% throughout most of the year. After a shower, the levels would rise to 80%, sometimes near 90%, but they would settle back down within fifteen or twenty minutes. If the door remained closed, it would stay humid much longer, but if the bathroom door was left open, the humid air would seem to mix with the dryer air and the normal humidity levels returned very quickly. All without any obvious ventilation at all. But there was another unexpected consequence of my data logging. 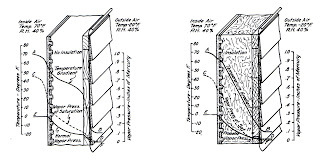 According to classic water vapour theory, the reason the inside of houses have a higher absolute humidity level than the great outdoors is because we live in them. We not only shower, but we breathe, sweat, cook and wash. We produce water vapour by the proverbial bucketload. So if we are responsible for all this water vapour, it should stand to reason that if you take us away for a few days, the humidity levels in the house should fall back into equilibrium with outside. And by equilibrium, we are referring to a state where the vapour pressure indoors matches that outdoors. This would suggest that in winter, the indoor relative humidity levels should fall back to around 25% or 30%. 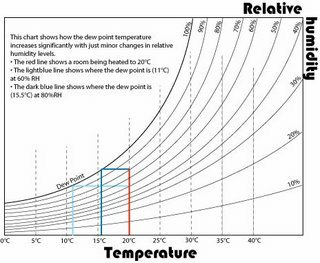 Use the accompanying chart to work out the difference between absolute and relative humidity levels. So what happens when we go on holiday or away for the weekend and remove the source of all this water vapour? Relative humidity indoors doesn't fall at all, it sticks at the 50% to 60% background level that occurs when we are in residence. There must be some unanticipated processes at work here. It could be that our house is so badly built that it self-ventilates through the fabric and therefore my findings are irrelevant. But that wouldn’t explain why the humidity levels remain higher indoors than outside even when we are away. I suspect that it’s got a great deal to do with the moisture buffering idea that I have been going on about in recent posts, but moisture buffering is a hard thing to measure, so my theory has to remain untested. Bearing in mind that there is about 100 times more bound water in the structure and furnishings in a house than there will ever be free floating water vapour in the air, my guess is that there is a sort of natural evaporation/absorption rate inside a house, which is largely determined by temperature, the humidity and the moisture content of the surrounding materials, and that the materials are capable of altering their moisture content without us ever being aware of it. In short, the house acts a bit like a sponge, soaking up and giving off water as conditions dictate. Only where you have bathrooms made up of entirely non-porous materials do you start to get problems with condensation. Or when you let the temperature of a room fall below dew point, somewhere around 12°C. Then you will start to see condensation and mould growth. If you keep the rooms reasonably warm and you have materials capable of absorbing excess moisture, then I don't think condensation is ever going to be a serious problem. Misting mirrors doesn’t count as serious. I am not so stupid as to believe that my homemade experiments constitute serious scientific investigation, but they are interesting to my mind because they are reasonably consistent and they indicate that something is amiss with our conventional understanding of the issues. If my pet theory is right, then we are guilty of over-ventilating, in order to remove a suspected hazard (excess water vapour) which seems to be largely self-regulating. In the short term, this is not a subject that is likely to get heavily researched because there isn’t a product or group of products out there waiting to be sold. Unless someone comes up with one. Anyone for vapour permeable wall tiles? As if to bear this out, an unhappy story comes to my attention today, also emanating from Edinburgh, although I think this is mere co-incidence.